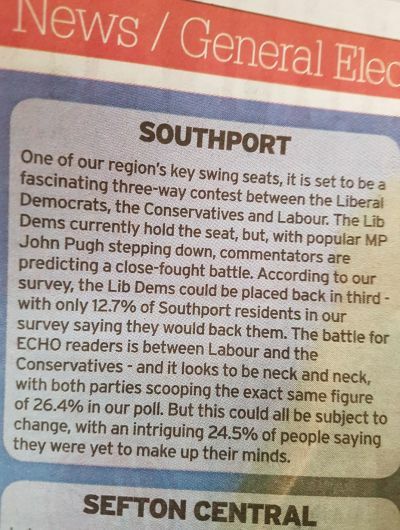 The latest general election poll indicates that Southport voters are turning to Labour. The poll, by the Liverpool Echo, reveals that Labour are currently tied with the Conservatives, both receiving over a quarter of the survey votes, with exactly 26.4% of the vote each. The Lib-Dems, meanwhile, are a distant third with less than half that at 12.7%. “We have been receiving a very favourable reaction on the doorsteps, and the poll strengthens our belief that Southport realises the choice in this election is between us and the Conservatives who’ve drifted far to the right.